kids clothing doesn't have to fit precisely (it's more drawstrings and elastic waistbands, less darts and zippers). because this part is easier, i can focus my energy on trying new and different techniques, patterns, and fabrics. i'm not really a clothes girl, seriously if i could pull off that whole steve jobs uniform thing i would. adult clothing takes a lot more fabric and time, which is tough for me to commit to. maybe i should explore that in therapy. i love my nieces but don't get to see them everyday. however they know i've made a good portion of their wardrobes so i like to imagine they think about me, on some level, once or twice a week when they wear what i've made them. all this is to say, if i'm sewing for myself it is usually for a good reason. and the everyday skirt from liesl & co is a very good reason. i first made the everyday skirt pattern last summer with some black kona cotton (originally from gather here) that had been sitting in my stash left over from a washi dress. it was love at first stitch. i could write a five paragraph essay on why this pattern is amazing, but it would boil down to this: flat front waistband, pockets, gathered elastic back, and very comfortable. sorry for the quality of the picture, i did not know then i would be blogging it one day. i picked 2 yards of this cobalt eyelet for $15 back in boston, with every intention of using it to make the girls something. two years and a cross country move later it was still just sitting there. so as part of my stash busting initiative (and because i hate going shopping) i decided to make myself something from it this past winter. this skirt actually came to be because of maya's lorax tunic. from the second sammie said the birthday theme was the lorax i knew exactly the fabric i wanted: the orange truffala tree print i had seen around for months. of course once i started looking for it wasn't in any of the local stores. i went to the internet to order some and while there i decided to to start researching canvas as i was thinking about making fitz a bed (and make him a bed i did, details on that later). once i saw this lion print from the cotton + steel august collection i knew my lil' guy had to have it. i mean how can you not love that face, and that fabric. by that point my total was $26.96, and i realized it would be be cheaper to order more fabric and get free shipping (they do that for all orders over $35) than if i paid for shipping and got less fabric. so when you think about it, buying more fabric was the fiscally responsible thing to do. when i saw this tangram print from the cotton + steel moonlight collection i remembered how much i liked it in gail's library dress and added some to my cart. a few weeks later this skirt was born. so there you have it, my love for the everyday skirt pattern expressed three times over. 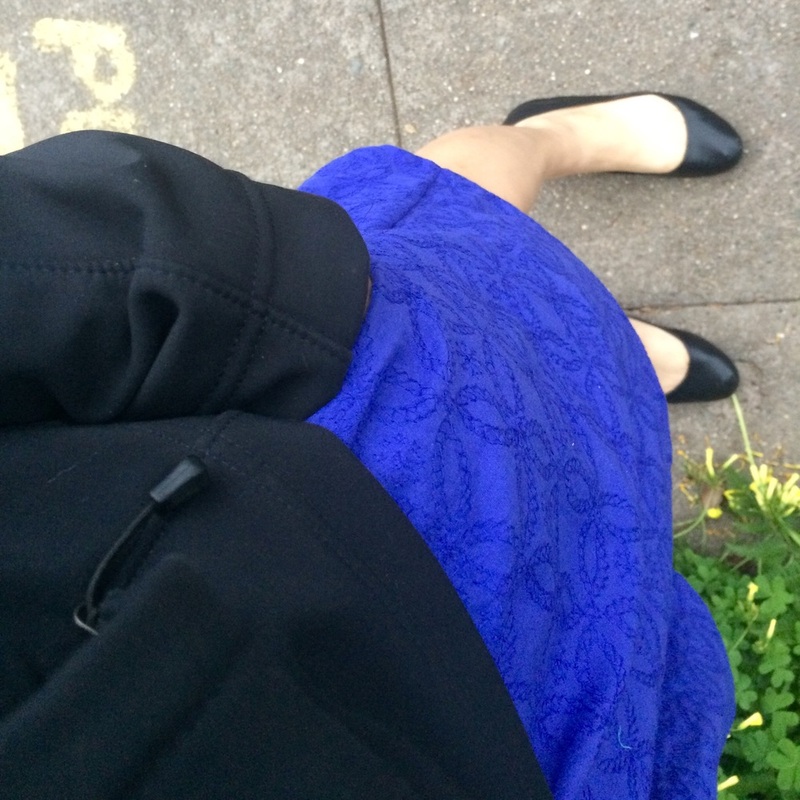 also in all three photos i am wearing jcrew cece ballet flats, and jcrew jackie cardigans. what can i say, i know what i like and i like what i know.